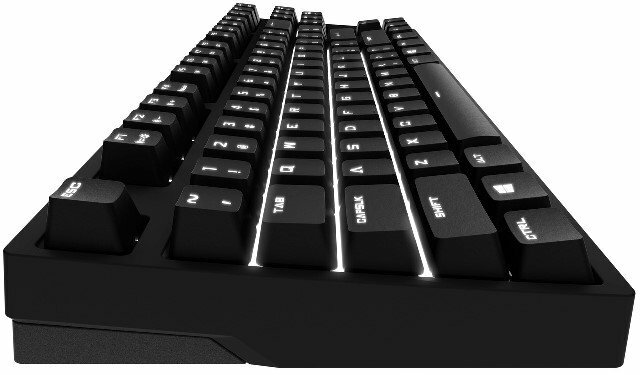 Cooler Master’s latest 10-Keyless mechanical gaming keyboard – the CM Storm QuickFire Rapid-i is now available. The new QuickFire Rapid-i has a fully backlit keys and comes with an ARM processor that enables responsive illumination, trailing effects and individual key lighting profiles. Check out the rest of its features, specifications, price and where to buy below. The Cooler Master CM Storm QuickFire Rapid-i features a fully mechanical Cherry MX key switches that is available in either Brown or Blue switches. All keys are fully backlit with white LED. The Rapid-i is a 10 keyless gaming keyboard meaning it lacks the numerical keypad which isn’t usually used in FPS games. This makes it easy to carry around specially during LAN parties and events. It features ActiveLite Technology thanks to the 32-bit ARM processor, giving it instant response and trailing light effects. There are 4 different lighting profiles. The CM Storm QuickFire Rapid-i also features a smooth and clean aesthetic, including laser-marked keycaps and a non-glossy matte finish over tactile and quiet mechanical switches. It has a response time of 1ms, in USB mode, offering gamers a necessary consistency to respond quickly in the latest games. Multimedia shortcuts are available to ensure that media can be controlled with ease. With N Key Rollover (NKRO), users deploying the QuickFire Rapid-i in either USB or PS/2 mode can activate many keys on the keyboard simultaneously. The Cooler Master QuickFire Rapid-i Cherry MX Brown switch is now available with a retail price of $134.99 here. Based on customers who purchased this product, it has been rated a perfect 5 out of 5 stars. Below is a QuickFire Rapid-i review video courtesy of Joanne Tech Lover.